A while back we published an article All about above ground pools and after that we received numerous requests to make an article on how to make a DIY pool deck around above ground pool and finally, here it is. 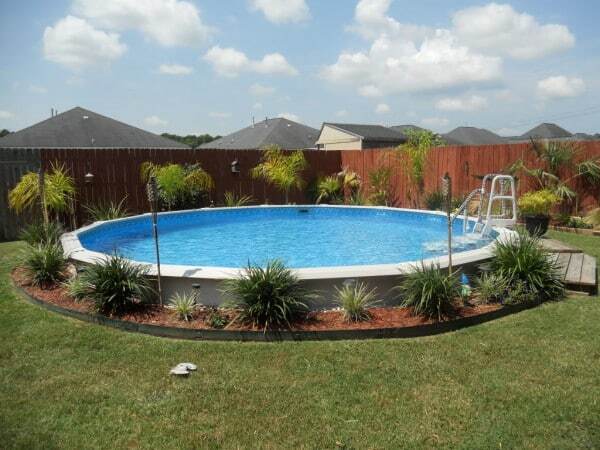 Above ground pools are great and cheap but if you want to take pool experience to the next level you need a place for sunbathing and relaxation next to the pool. Most of people think that building DIY pool deck is to complicated task for them but it really isn’t. It’s a large project in scale but it’s not difficult to make and doesn’t require professional skills. 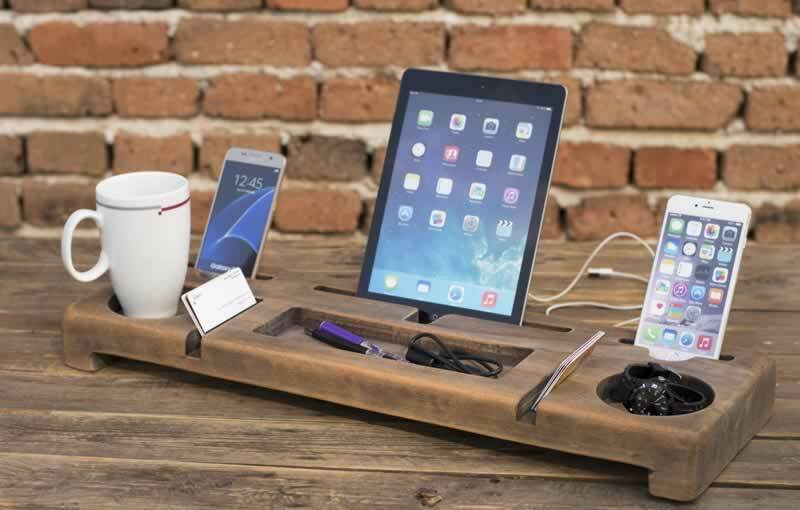 All you need is good lumber, basic woodworking skills and some time. The size of the deck is determined by the size of your pool and your personal wishes. Once again, the principal for small and large deck is the same, only differences are in amount of materials and labor. 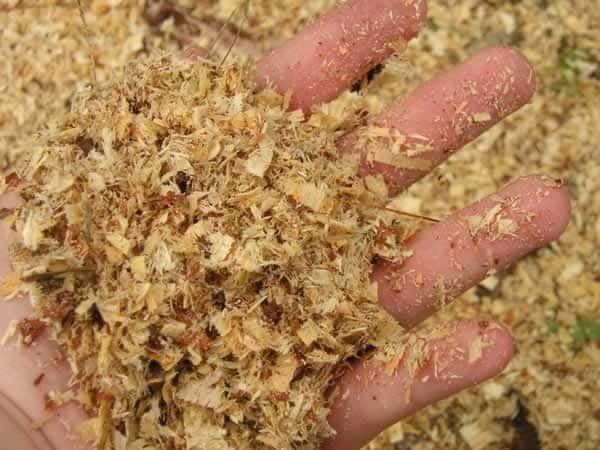 The first thing in any DIY pool deck project is clearing the ground where your future deck will be. Strip all the grass and around 2 inches of dirt where your construction site will be. For the posts we used 4 x 4 lumber and we advise you not to use smaller lumber than that. First take four boards and setup the future look of your deck on the ground. Use that to mark the spots for the posts and remove the boards. Use a post hole digger to dig up holes slightly bigger than the posts. Make sure that your holes are deep enough and that they are below the frost line, at least 3.5 ft. Set the posts in the holes, level them and start to fill the holes with rocks. Once you’re half way there use four larger rocks and secure the post on each side. Then fill up the rest of the hole with rocks. You can also use concrete but this method will be solid also. 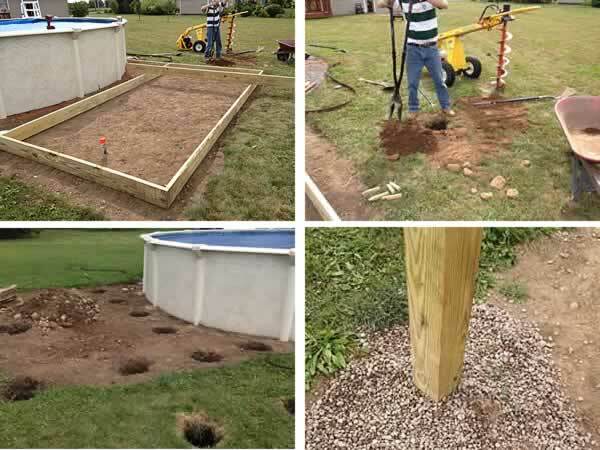 Don’t forget to protect the part of the post which goes into the ground with waterproof wood sealant because otherwise the posts will rot in the ground. After all the posts are in place it’s time to start with the frame. For the beams and joists we used 2 x 6 boards and we advise you to not to used smaller lumber than that. Before you start with the frame, take four pieces of 2 x 4 and use them to temporary secure and level the corner posts. After you screw in the beams you don’t need them anymore and you can remove them. Your beams need to be perfectly leveled and it’s hard to achieve that if both ends of the beam are loose. 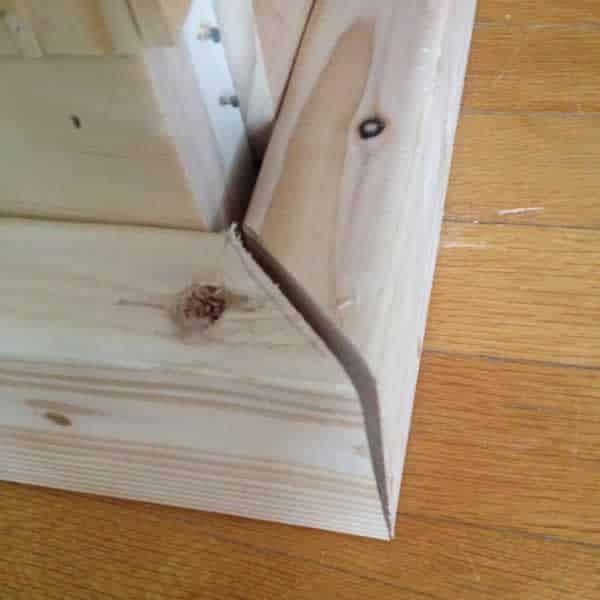 Use a small piece of wood and temporary screw it to the post below the selected height of the beam and place one end of the beam on it. That way you’re aligning only one end of the beam and you’ll see it’s much easier to level the beam this way. 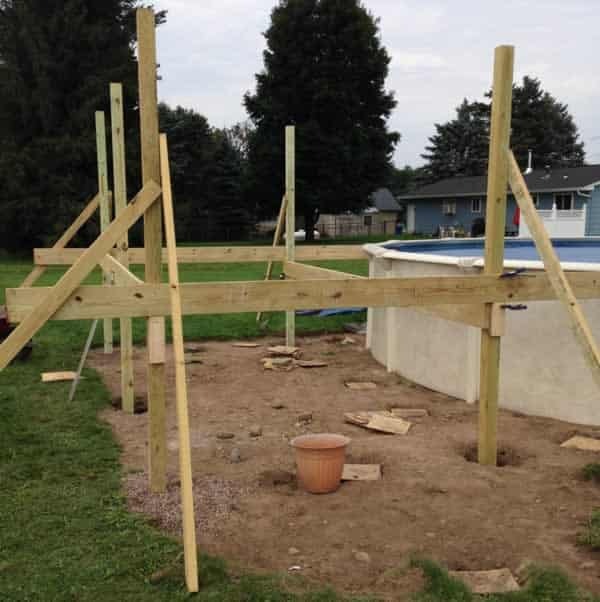 The three outside beams must be the same height and the one near the pool will be 6 inches below. The main frame is now done and you can now secure all the posts and put weed barrier and stone below your future deck. 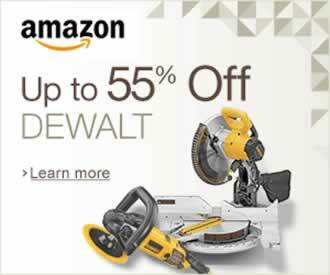 We advise you to do that now because after the deck is finished it’s hard to crawl under it. 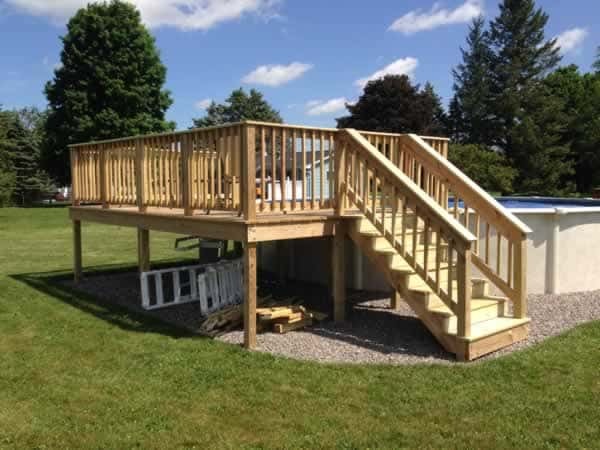 It’s time to construct the staircase for your deck. For that you’ll need two pieces of 2 x 12 for stringers, 7 pieces of 2 x 6 for risers, 6 pieces of 2 x 8 for runners, one piece of 2 x 6 for the top runner and two pieces of 4 x 4 for the stair posts. 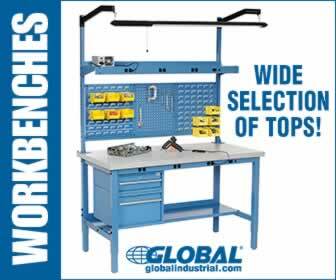 Make 6 inch rise and 8 inch run on both stringers and mount them on the beam with stair stringer brackets. Separate the stringers depending on the size you want your stairs to be. Dig up two smaller holes and put 4 x 4 at the end of both stringers and secure them to the stringers. 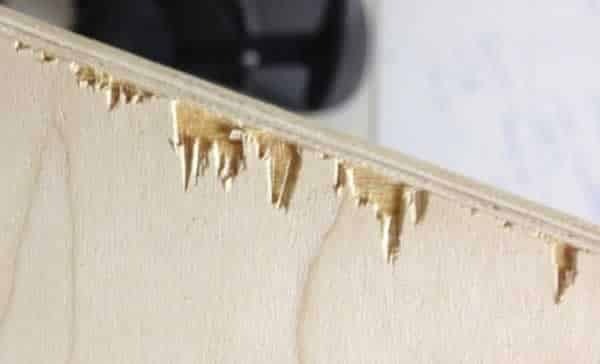 Before you start with the joists we advise you to temporary secure the upper ends of the posts with 2 x 6 boards. This will reinforce the structure and prevent it from moving while installing joists. After you install the joists you can remove them because the structure is secured with joists now. Joists are used as a base for the flooring and you need to do that part with extra care if you want to have a nice and leveled deck. For the joists we used 2 x 6 boards and we secured them additionally with corner brackets. You have to measure the length for each joist because the shape of the pool determines the length of the joist. 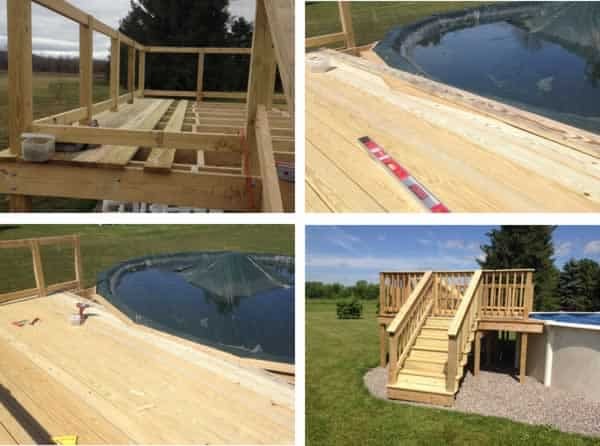 When you measure the distance, take away 2 inches because you will insert boards between the joists and the pool and connect them with joists. You need to put one joist at least every 20 inches if you want a sturdy decking. We installed one joist on each side of every post for additional security and also we installed blocking between the joists to prevent them from twisting. Also we secured the joist on each corner with corner brackets. You probably noticed that the posts aren’t the same height and that they are probably to high. You need to decide how high your railing will be and mark the height on one post. The use a 2 x 4 and a level to transfer that height on other posts. Trim all the posts on the same height and use the 2 x 4 for the top and bottom rail. 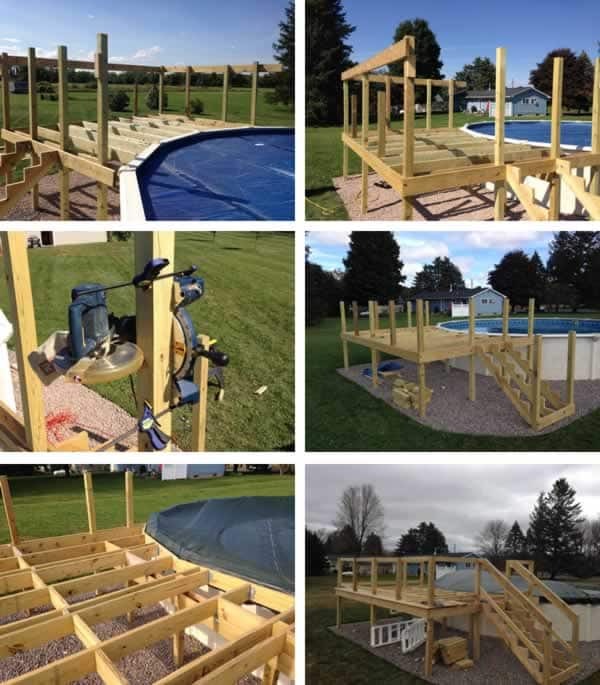 Your DIY pool deck project is coming to a final stage, it’s time for decking. For decking you can use 5/4 x 6, 5/4 x 8 or 5/4 x 10 boards. We used 5/4 x 6 decking boards because it looks better. First use 1 x 4 boards and secure them around the pool edge, closing the gap with the pool completely. Then start to lay 5/4 x 6 boards from the far end and work your way to the pool. When you come to the 1 x 4 boards it will be a little tricky to cut the perfect shape to match the gap. The trick is to put the board on top of the 1 x 4 board and align it to the last 5/4 x 6 board. Then crawl under the deck and mark the gap with a pen and then cut the board. 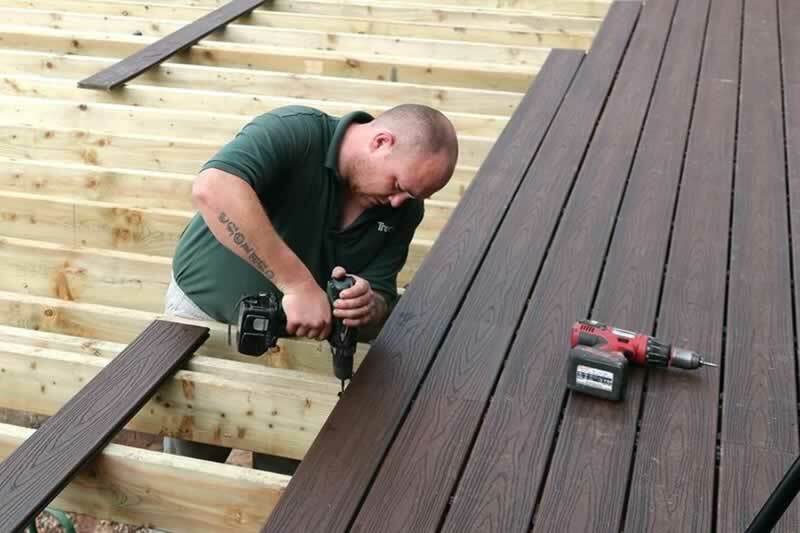 Decking is really a simple process, just make sure that you secure each board with each joist with wood screws. And always first drill a hole slightly smaller than the screw to avoid cracking and splitting. After you complete the decking finish the stairs by installing the risers and runners. The final thing left to do is railing. It’s really a decorative final touch and you can complete this part in the way you prefer. We mounted the 1 x 2 spindles every 6 inches and 1 x 4 boards on top of the railing. 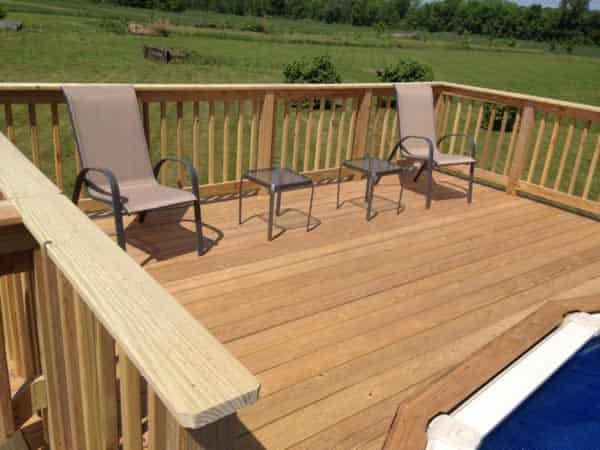 Your new DIY pool deck is now finished and now you can add some finishing touches. If you have kids you can make an entrance gate. If you don’t know how to make the gate check out our tutorial on how to make DIY small fence gate. 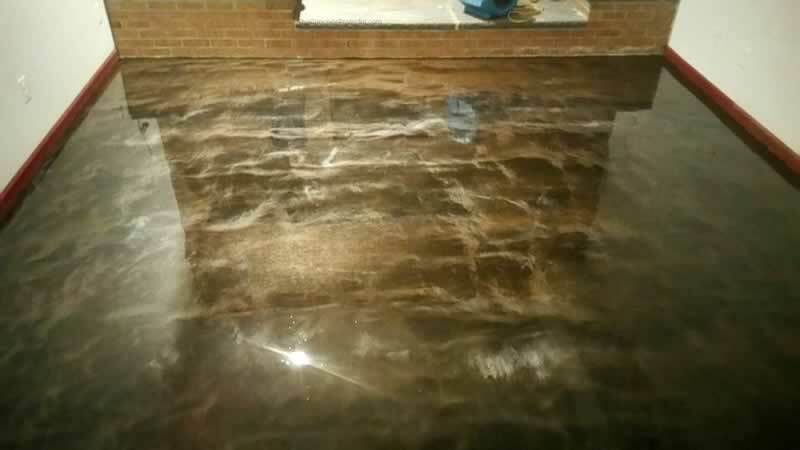 You have to protect the deck with waterproof wood sealant before usage and that’s a must if you want your deck to last. Finally put some deck chairs and sunshade and enjoy a cold drink by the pool on your new DIY pool deck. What were the amounts of materials needed for this project? I see others asked but haven’t been answered. I’m planning on doing this and would love assistance with supplies needed. Thanks! Hi! Can you tell me about how much you spent for materials if we plan to do this on our own! We live in kodak, TN. Would love a list and most importantly a price estimate. Can I get a supply list for the pool deck please and thank you..
Are there plans available for this? It’s hard to see exactly what’s going on from the images, many of which are pretty small. 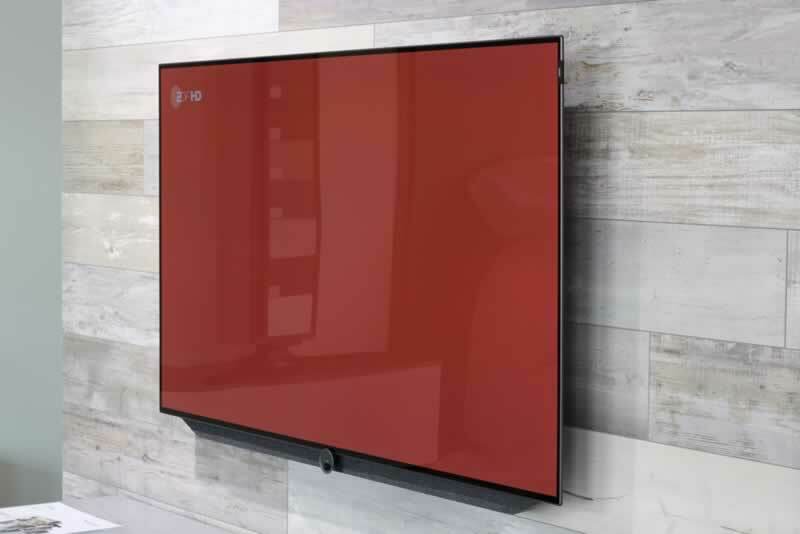 Can I get a list of Materials for this exact project? do not need pricing, just the materials list would be great. Thank you! Will this deck for an 18 ft pool. Need material list and price estimate for Beacon, NY if possible. Thanks. I have seen a ton of comments about a materials list where and how can I get one? Thanks a bunch! 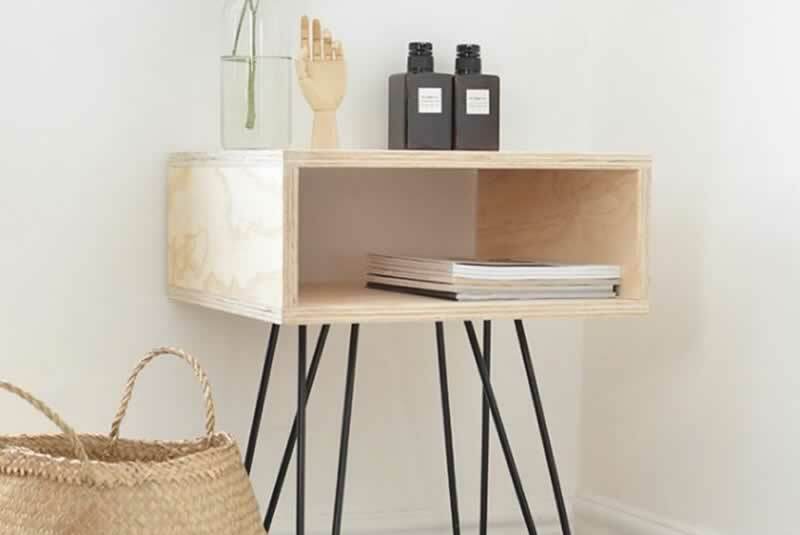 Can you send me a supply list for this one that you built in the article please? Great information. I do agree a materials list would be awesome! 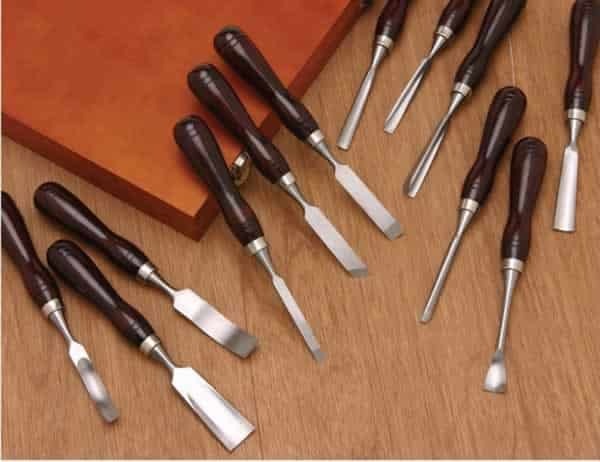 I’m looking for a materials list. We are planning an 8x 12 foot deck. It’s hard to tell the price of a deck, it all depends on the price of building materials in your country/area and the price of a contractor! If you’re planning to build it yourself then you can tell us where you’re from and we’ll give you the estimate price of building materials! How much did it cost to build this deck? We want to get an above ground pool for our girls nexxt year with our income tax and if we have enough left over we would like to build a deck. Is there a material listing somewhere? I just want to make sure we have everything necessary. you can use as many beams you want, but there is no need for extra beams! When the whole structure is inter-connected there aren’t stability issues what so ever! What is the spacing for your posts? How did you determine only to use 1 beam? It seems at least 2 beams, 1 where you have it and 1 closer to the front of the deck would be more stable??? My deck will be 12 feet from the pool, how many beams would I need? For the 1×4 boards covering the gap around the pool in step 4 how did you get the shape of the pool support top cap? Other than these questions this is a Great write up that I will use when building mine this spring. I wish I had the skills do make things like this. It looks beautiful! And a deck makes above ground pools like 1000x better, since climbing into them with a ladder is such a pain. Much easier just to jump off a deck! What was the cost for the materials? what is size of this deck in picture?